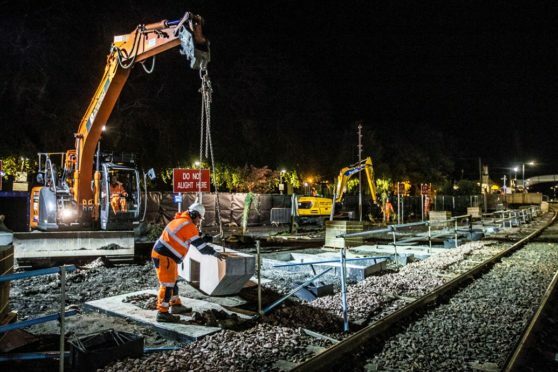 Network Rail engineers will be working around the clock to complete a multi-million pound programme of upgrades on the Highland main line. The line will be closed between Perth and Inverness from end of service today until the start of service on Tuesday. Buses will replace trains on Saturday, Sunday and Monday. Over the weekend engineers will be working to complete new infrastructure between Perth and Inverness – including laying track at Aviemore, testing newly-installed signalling systems at Aviemore and Pitlochry and introducing longer platforms at Pitlochry. This weekend marks the completion of main work on the Highland Main Line Improvement Project to remodel and extend the tracks at Aviemore station, extend platforms at Pitlochry and carrying out signalling upgrades to allow more trains to run on the route. The project has also helped to conserve the history of the stations; working with the community to restore some of Pitlochry station’s decorative features including the Victorian water fountain and benches. A £57m Scottish Government-funded investment in the line linking Inverness to the Glasgow and Edinburgh. The project aims to deliver an hourly service, with average journey times reduced by around 10 minutes and enable potential improvements to the times of the first and last trains between Inverness and the Central Belt. Matthew Spence, route delivery director for Network Rail, said: “The upgrades we are delivering to both track and signalling on the Highland main line are vital to delivering more and faster trains and providing greater choice for customers.